Like I said in my previous post, I will use chicken in my next Panaeng curry dish. 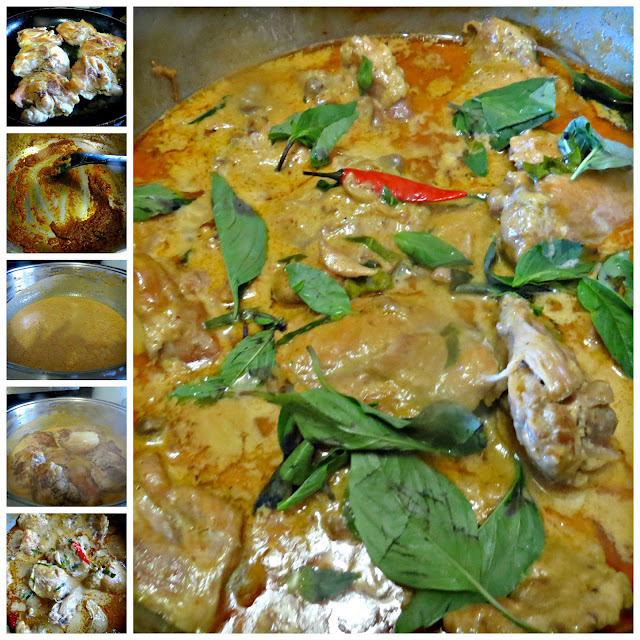 The ingredients save for the meat are the same with the addition of Thai basil leaves. This is even quicker to prepare because chicken cooks faster than beef. I opted to use the thighs for a more flavorful version but removed the skin. I still have to start with the browning step as it creates that crust and texture that holds the meat together even if it's been simmering for a long time. I don't like it when the meat starts falling apart although I have to break it anyway as I eat. Maybe it's just me so you can skip the searing/browning the meat step and proceed to the next step. Heat vegetable or canola oil in a large skillet or wok over medium heat and brown chicken thighs on both sides. Set aside when done. In the same pan, fry the curry paste until fragrant. Stir the coconut milk into the curry paste and bring to a boil. Add the chicken; cook and stir until the chicken is nearly cooked through, 10 to 15 minutes. Stir the palm sugar, fish sauce, and lime leaves into the mixture; simmer together for 5 minutes. Taste and adjust the saltiness by adding more fish sauce if necessary. Garnish with sliced red chilie peppers and Thai basil leaves to serve. You may not have kaffir lime leaves or Thai basil leaves ready and settle with what's available in your pantry but I suggest you use the original ingredients when you can. You will find out what makes it different from other curry dishes.